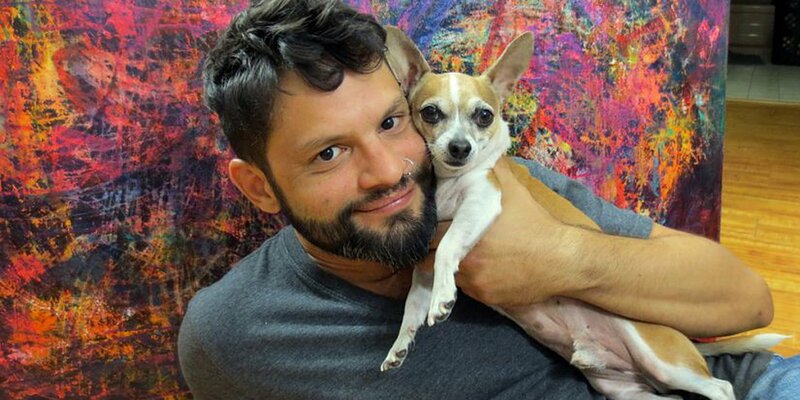 US painter Nestor Toro speaks to Artfinder about having dinner with our CEO in Hollywood, his exclusive SALE and his life in West Hollywood! Nestor Toro is based in West Hollywood, USA. Nestor first decided to sell his paintings when returning to LA after a very creative six year stint in Buenos Aires. Nestor now has dreams of getting a larger studio in 2017, as demand for his larger works is really picking up pace. His one-of-a-kind abstract paintings have caught the eyes of our customers, so we got in touch and had a chat with Nestor to find out more. “As a child I am not sure that I knew 'being an artist' was something that people actually became. I just knew famous artists from my frequent trips to the famous art museum in Ponce Puerto Rico, near where I grew up. I have always been creative and enjoyed art but it was not until I moved to Buenos Aires, Argentina with my partner that I started to paint. We love to travel and after a trip to Argentina we just decided to give everything away and move from Los Angeles. Something about the city's energy motivated me to walk into an art store and buy a cheap set of watercolours, a couple of brushes and some paper. I just took to it and then soon moved to acrylics and canvases! We ended up staying in Buenos Aires for six years! From almost my first day there, I painted everyday. During these years I taught myself and developed techniques that I continue to work with and evolve everyday. When we finally decided to move back to Los Angeles, we moved back to West Hollywood where we had lived before. It is an area known for it's creative individuals and there are many studios, galleries, and movie productions studios. So the creative vibe is always in the air. So I found myself back in LA with a few hundred finished works that were brought back with us, from Argentina and I thought - now let's get into selling art! To me, being a working artist was a really unknown and magical idea, so in 2013 I decided to give it a go!" “Being an artist (in the USA anyway) means being a rebel, because you are choosing to not conform to having an expected 9 to 5, five days a week job working for someone else. I don't consider being an artist 'traditional work', but it certainly is 'work' if you strive to be a working artist like I do. Being an artist gives me freedom and that freedom allows me to create whenever the creative mood hits. There is a myth of the starving artist, that perpetuates the idea that if you are an artist that makes money then you are not a 'true artist'. I think this idea is BS! Using your natural talents and doing something you enjoy to make a living doesn't lessen the artistic value of my work at all. Competition is stiff and there are a ton of talented artists out there, so for me to stand out I have to work hard at it. I create abstract work because I find it a challenge to produce works that are not preplanned and put them within the confines of a canvas. Painting is an experience, and to create something visually instead of using words is a real challenge! I like to use a variety of painting styles because I have so many ideas that they simply can not be confined to one particular style. But I think when my work is viewed as a total body of work, my distinctive voice and style is very clear." "In West Hollywood, LA many artists have working studios that they also live in. This is because space is limited. My working space is the majority of our living area too, so it is really like living in a working studio! I have a really supportive partner I live with who is very understanding, which is a huge help! He is a self-employed entrepreneur working online. There are lots of benefits to living in the same space as I work. It gives me the opportunity to get up at anytime, when I am struck with the need to paint and to get to it immediately. I have my two chihuahuas who are always here to keep me company and to remind me to take a break now and then, if only to take them out for a walk! It's also nice to be able to have lunch everyday with my partner. Next year I plan to move to larger studio. I need more room from my supplies and larger canvases which take up more space. In fact, just last week I had a commissioned canvas delivered to a customer that was 89 x 66 inches... I could barely get it through the door! Getting a larger studio is going to be a challenge but I think that it will make things easier to keep things organized, and have several large projects going on at the same time. Nestor with his studio assistants! “Travel certainly inspires me! It is the only way to have a fuller understanding of the world we live in, and the human condition. I lived in Rio de Janeiro for a year and made some journals, photographs and drawings. I started to seriously paint in Buenos Aires and took my first art class there. It was also there that I entered my first shows. This was so crucial to my development as a painter. Music is another love of mine and most certainly motivates me. My taste runs from Metallica to classical. I will often listen to Joni Mitchell and Tori Amos while painting. Both reference painting in their music and Joni has even said she considers herself a painter first and a singer songwriter second! “The biggest challenge is that there is a lot of competition and it takes a combination of time, hard work and just a bit of luck to get noticed and to start selling. You have to stuck with it and believe in yourself. Just last week I was commissioned to do an 89 x 66 inch painting for a client's new home. They love my work but I had nothing of that exact size. You just never know what the day will bring, which means the future is always full of potential. This is one of the most scary and yet exciting parts of being an artist! I sometimes get creative blocks, but it's more the case of having an idea in my head that I can visualize but never get the chance to put it onto the canvas. Now that is frustrating! It usually means that I am just bored with a particular “style” and am wanting to change direction. These moments can make me wonder if I will ever make anything I like again." “I admire many artists, some of my all time favourites are Mitchell, Kandinsky, Matisse, and Rothko. I like Mitchell's take on landscapes, her colour layering and the spontaneity and freedom in her work. Kandinsky was clearly a master of the interaction between colour and form, who developed geometrics. I love Rothko's stunning color blending, depth of field and large format works. “My role models are successful working artists who are working for themselves, and making wonderful art that the world values enough to pay for. “I think that we need to live in the moment and that art should capture our attention and bring us into the moment! Some people don't understand that being an artist is a calling and not just a job or a way of making money. Some might think I am wasting my time by not having a 'regular job' and knowing where my next pay check is coming from. I think that they don't understand that it actually takes a lot more work to make something using just your creativity, than to show up to a job that most people do and don't usually enjoy. I am happy creating and I think I have the most wonderful “job” in the world! “I love that Artfinder allows artists to have their work be seen by the entire world, instead of just a few collectors within driving distance of a certain gallery. To have the ability to sell to every country in the world is something no other brick and mortar gallery can do! Just look at the diversity of the artists you can see on Artfinder. Artfinder supplies something that no traditional gallery can, simply due to the constraints of space. Nestor at dinner in Los Angeles with CEO Jonas Almgren, his partner Lee and fellow painter Chantal Barlow. "I have a couple of exhibitions in the planning stages for Spring 2017, but no confirmed dates yet. I plan to continue with selling my artwork on Artfinder of course! One ongoing goal is to continue to develop my artwork so that the demand will continue to grow, and ultimately my work will become more and more collectible. Since I don't look at making art as a 'job' but rather a calling, I don't ever plan on stopping. I just plan to keep pushing my practice and making art everyday! “I would say to be realistic with the time that it is going to take for you, to get noticed. So my biggest advice is to have patience. My second piece of advice is to have your own voice. Do not copy another artist! Sure, be influenced by others, but don't copy anything. Use your own voice. If you try to copy there will be nothing of you in the art and ultimately what a customer is buying is your ideas! Ronald Hunter describes himself as not only artist, but entrepreneur. Ronald has sold over 300 paintings since April 2015... read more to hear all about Ronald's astonishing success!